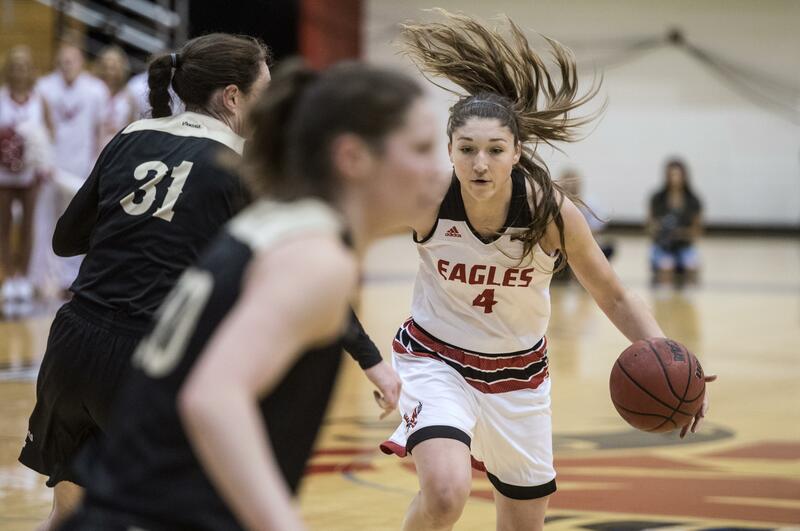 UPDATED: Tue., March 6, 2018, 6:35 p.m.
RENO, Nevada – If the Eastern Washington women didn’t have enough motivation, the Big Sky Conference provided them with more on Sunday. Now the Eagles hope to channel that emotion into a deep run in this week’s conference tournament. Despite a 22.6 scoring average that ranks fourth in Big Sky history and leading the Eagles to a surprising third-place finish, senior forward Delaney Hodgins didn’t win the league’s Most Valuable Player award. Continuing a trend of giving that honor to the top player on the regular-season champion, the MVP went to Savannah Smith of Northern Colorado. “Not to diminish the performance of Smith … but Delaney is one of the top three all-time greatest players in conference history, and has had a senior year to back it up,” Eastern coach Wendy Schuller said. “I’m heartbroken, she’s hurt and the team is mad,” Schuller said. The Eagles (17-13) also are on a four-game winning streak heading into Wednesday’s quarterfinal against Portland State. Tipoff is at 8 p.m. at the Reno Events Center. “We are playing probably playing our best basketball, playing really unselfishly,” said Schuller, whose team almost reached the final a year ago, falling 61-59 to Montana State in a controversial finish in the semifinals. To get there again, the Eagles will need another strong tournament from Hodgins, a two-time first-team All-Big Sky pick, and guard Violet Kapri Morrow, a third-team selection who’s averaging 14.7 points. “(Morrow is) a huge part of why we didn’t finish seventh,” said Schuller, referencing where the Eagles were picked to place this year. Starting point guard Symone Starks suddenly left the team for personal reasons last month, but freshman Brittany Klaman “has been so steady and solid for us,” Schuller said. “She doesn’t turn it over and makes good decisions,” said Schuller. That will come in handy against the sixth-seeded Vikings (18-12), who put their length to good use in a 2-3 zone defense. On Monday night, PSU got 24 points from guard Sidney Rielly in a 77-61 first-round win over Northern Arizona. “That zone is tough,” said Schuller, whose club split with the Vikings this year. After a rough 75-60 loss on the road on Jan. 4, the Eagles bounced back and topped the Vikings 64-57 in Cheney on Feb. 3. If the Eagles win, they’ll face second seed Idaho or No. 7 Montana State in Friday’s semifinals. Published: March 6, 2018, 4 p.m. Updated: March 6, 2018, 6:35 p.m.